Model of human eye, by Louis Thomas Jérôme, France, 1870. Model of human eye, French, c 1870. Model of an eye, Europe, 1601-1700. Anatomical model of a human head, Europe, 1801-1900. Intraocular lenses for the eye, England, 1979. 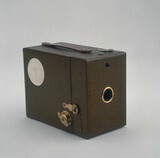 Kodak Hawk-eye 50th anniversary camera, 1930.